The musician's musician - with a remarkable track record of accomplishments. Born in Brooklyn, New York into a musical family (his father was a church organist and his cousin played piano with Miles Davis), Marcus became proficient on piano, organ, clarinet, voice and bass by the time he was 14. While his aptitude on clarinet gained him entry into New York's prestigious High School of Music & Art (the FAME school), it was his attitude on the bass guitar that landed him the gig in the legendary Saturday Night Live house band (at 17!) which ultimately began his professional career. There he met saxophonist David Sanborn, who took him in as a collaborator. From there he has carved an identity as a sought-after producer and songwriter working with such greats as Luther Vandross, Natalie Cole, Roberta Flack, Al Jarreau, Chaka Khan, Boz Scaggs, Wayne Shorter and many others. 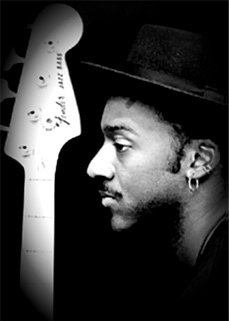 Simultaneously he has sustained a reputation as one of the world's premiere bassists playing on scores of dates with some of the best known artists in jazz, rock, and R&B. When Miles Davis called, a musical partnership was born that created some of the most important jazz of the 80's including the seminal Tutu album. Marcus' Grammy-winning solo albums, film scoring and soundtrack contributions have further demonstrated his incredible versatility. One time I asked Marcus how it had come to pass that he had been involved in so many great projects. He said, "Well, it all comes from being committed to your instrument...practicing, continuing to learn and grow. When you do that, the good projects come to you." Like I said....a musician's musician.